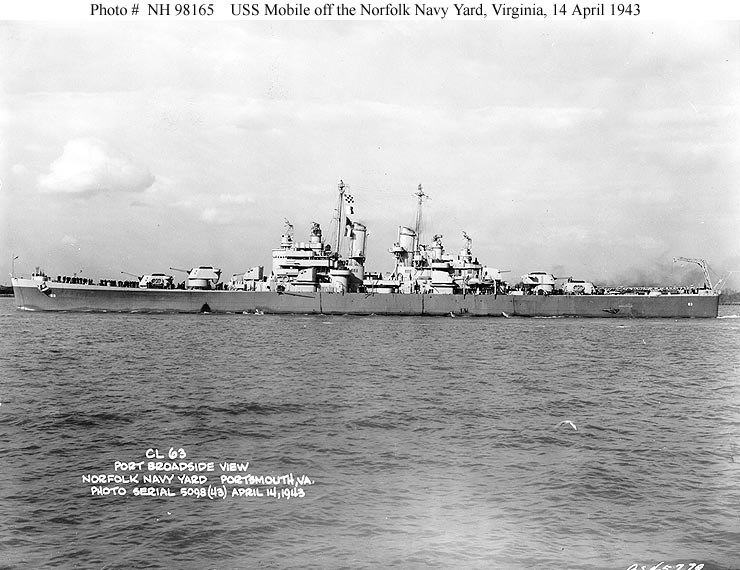 Figure 1: USS Mobile (CL-63) off the Norfolk Navy Yard at Portsmouth, Virginia, 14 April 1943. Official US Navy Photograph, from the Collections of the Naval Historical Center. Click on photograph for larger image. 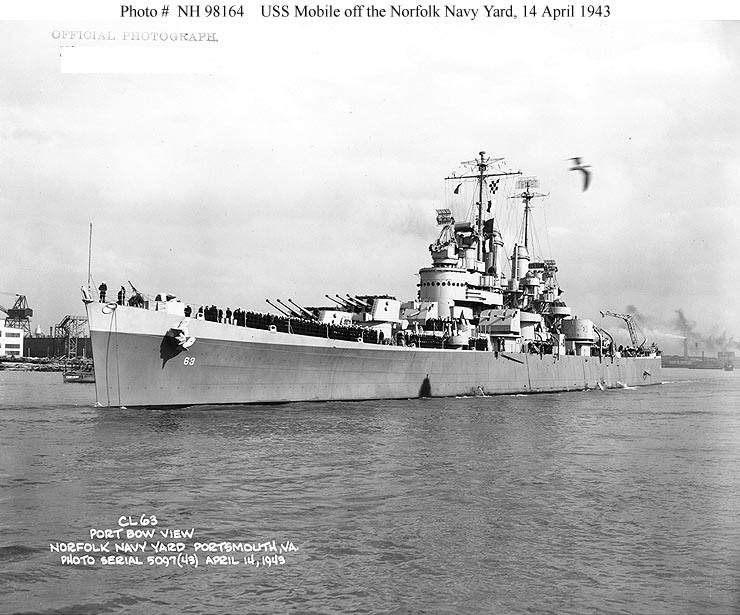 Figure 2: USS Mobile (CL-63) off the Norfolk Navy Yard at Portsmouth, Virginia, 14 April 1943. Official US Navy Photograph, from the Collections of the Naval Historical Center. Click on photograph for larger image. Figure 3: USS Mobile (CL-63) off the Mare Island Navy Yard, California, 18 July 1943. Official US Navy Photograph, from the Collections of the Naval Historical Center. Click on photograph for larger image. 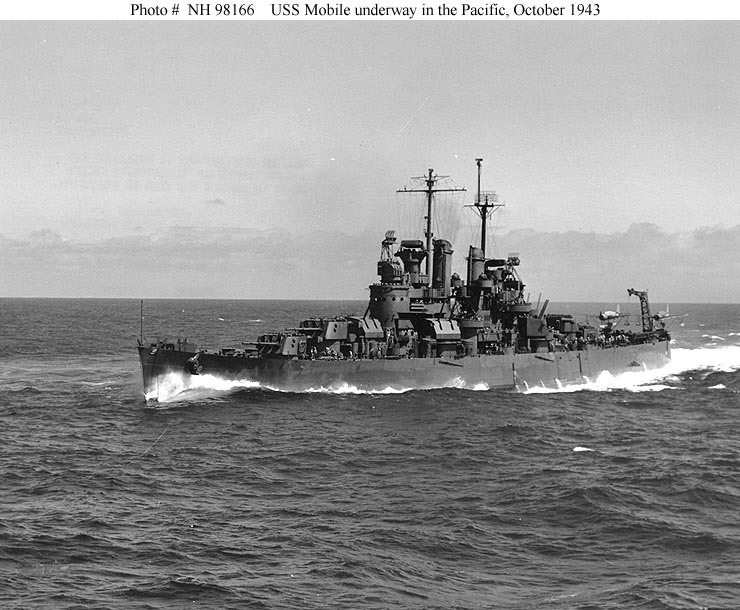 Figure 4: USS Mobile (CL-63) underway in the Pacific, October 1943, probably at the time of the raid on Marcus Island. Photographed by Lieutenant Commander Charles Kerlee, USNR. Official US Navy Photograph, from the Collections of the Naval Historical Center. Click on photograph for larger image. 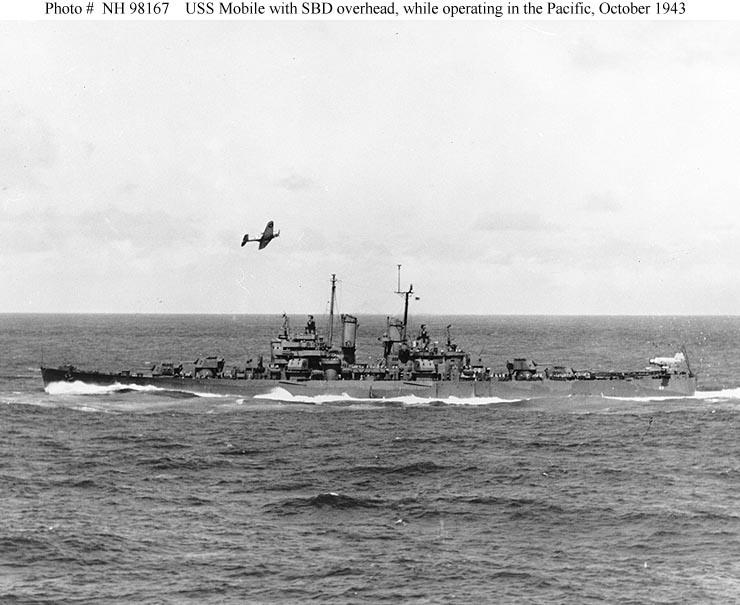 Figure 5: USS Mobile (CL-63) underway in the Pacific, with an SBD aircraft flying overhead. 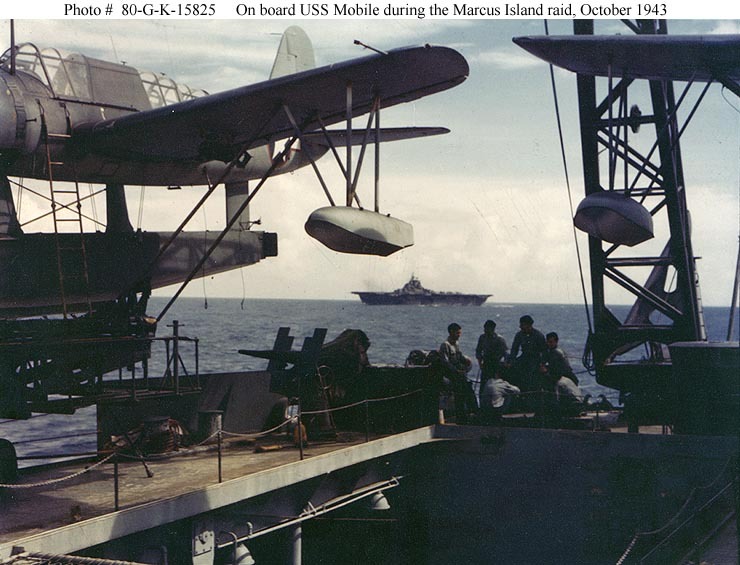 Taken during combat operations in October 1943, probably at the time of the raid on Marcus Island. Photographed by Lieutenant Commander Charles Kerlee, USNR. Official US Navy Photograph, from the Collections of the Naval Historical Center. Click on photograph for larger image. Figure 6: USS Mobile’s (CL-63) plan view amidships, looking aft, taken from a pier-side crane at the Mare Island Navy Yard, California, 18 July 1943. Circles mark recent alterations to the ship. Note: antennas for SG radar atop the fore and main masts; Mark 34 and Mark 37 gun directors, with antennas for Mark 8 and Mark 4 radars atop them; fully equipped life rafts. Official US Navy Photograph, from the Collections of the Naval Historical Center. Click on photograph for larger image. 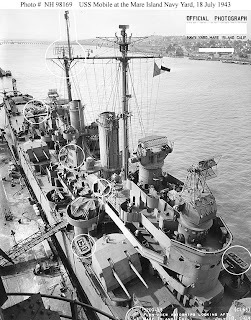 Figure 7: USS Mobile’s (CL-63) plan view amidships, looking forward, taken from a pier-side crane at the Mare Island Navy Yard, California, 18 July 1943. Circles mark recent alterations to the ship. Official US Navy Photograph, from the Collections of the Naval Historical Center. Click on photograph for larger image. 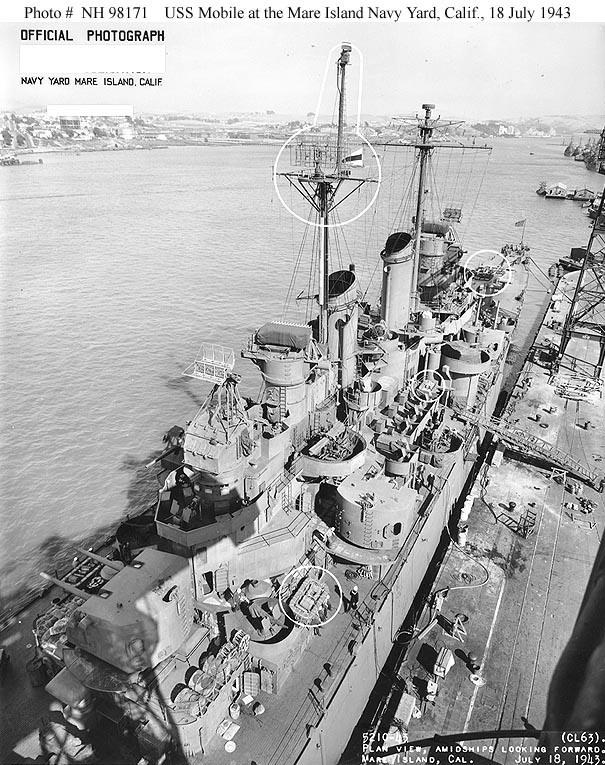 Figure 8: USS Mobile’s (CL-63) plan view aft, taken from a pier-side crane at the Mare Island Navy Yard, California, 18 July 1943. Circles mark recent alterations to the ship, in this case newly installed life rafts and floater nets. 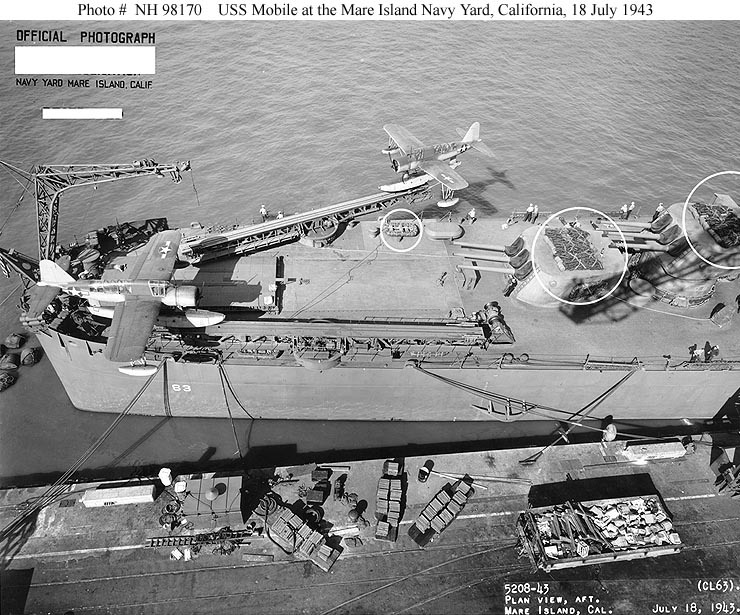 Note OS2U "Kingfisher" floatplanes atop the ship's catapults. Official US Navy Photograph, from the Collections of the Naval Historical Center. Click on photograph for larger image. Figure 9: View from USS Mobile’s (CL-63) fantail, looking across her open aircraft hangar hatch toward the starboard quarter, during the October 1943 raid on Marcus Island. Vought OS2U "Kingfisher" floatplanes are on her catapults. The plane on the starboard catapult has a small bomb under its wing. USS Yorktown (CV-10) is in the center distance. Photographed by Photographer's Mate Alphonso Ianelli. Official US Navy Photograph, now in the Collections of the National Archives. Click on photograph for larger image. Figure 10: Battle of Leyte Gulf, October 1944, with USS Mobile (CL-63) firing on the Japanese destroyer Hatsuzuki, during the evening of 25 October 1944, at the end of the Battle off Cape Engaño. Photographed from USS Wichita (CA-45). Official US Navy Photograph, now in the Collections of the National Archives. Click on photograph for larger image. 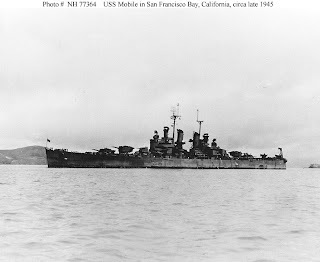 Figure 11: USS Mobile (CL-63) in San Francisco Bay, California, circa late 1945. Courtesy of Donald M. McPherson, 1973. US Naval Historical Center Photograph. Click on photograph for larger image. 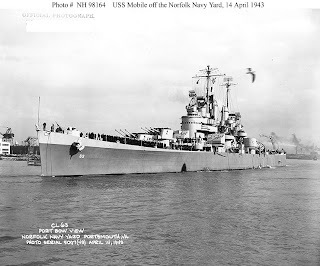 Named after a city in Alabama, USS Mobile (CL-63) was a 10,000-ton Cleveland class light cruiser that was built by the Newport News Shipbuilding Company at Newport News, Virginia, and was commissioned on 24 March 1943. The ship was approximately 610 feet long and 66 feet wide, had a top speed of 33 knots, and had a crew of 1,266 officers and men. 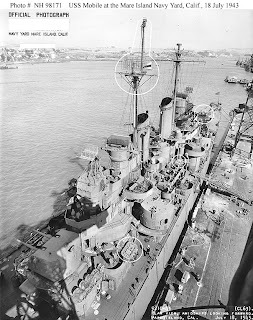 Mobile was armed with 12 6-inch guns, 12 5-inch guns, and 28 40-mm guns. 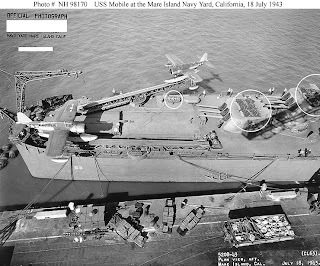 Mobile also carried one Vought OS2U "Kingfisher" floatplane on each of her two catapults. 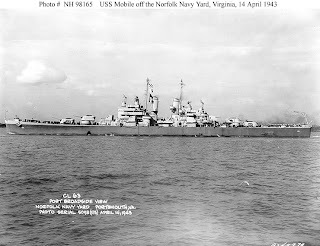 After being commissioned in March 1943, Mobile completed her shakedown cruise along the east coast of the United States. The ship then was sent to the Pacific and almost immediately participated in bombarding Japanese-held islands. 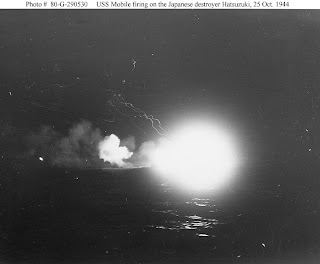 On 31 August 1943, Mobile bombarded tiny Marcus Island, hitting the Japanese garrison there. On 18 September, the cruiser did a preliminary bombardment of Tarawa in the Gilbert Islands. 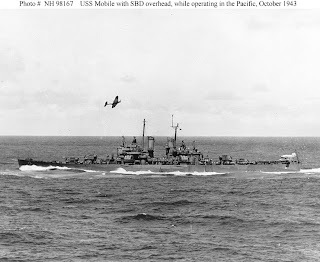 Then on 5 and 6 October, Mobile pounded Wake Island, which had been taken from the United States at the beginning of the war, and on 21 October, the light cruiser hit Bougainville in the Solomon Islands. In November 1943, Mobile participated in the actual invasions of Bougainville and Tarawa. She was then assigned to Task Force 50, a fast carrier task force, on 1 December and joined the initial attack on the Marshall Islands. After a brief return to Pearl Harbor, Hawaii, and then San Diego, California, Mobile was sent back to the fighting. In late January 1944, Mobile participated in a major American assault on Kwajalein Atoll in the Marshall Islands. For roughly two weeks, the ship pounded targets on Kwajalein in support of the American amphibious landings on the island. From mid-February through May 1944, Mobile was attached to carrier task forces that assaulted targets throughout the central Pacific and along the northern coast of New Guinea. 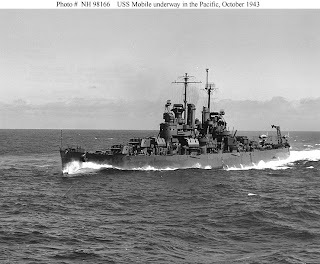 She went on to participate in the Marianas campaign in June and July, which included the Battle of the Philippines Sea. 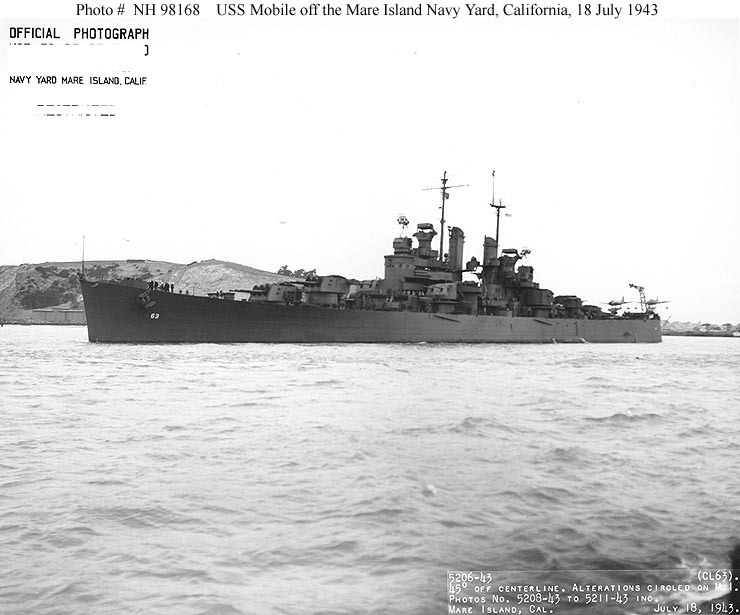 In early August 1944, Mobile made a surface sweep through the area of the Bonin and Volcano Islands, assisting in the sinking of one Japanese destroyer and a large cargo vessel. Mobile screened carriers during the Palau Islands campaign in September 1944, and went on to bombard numerous Japanese targets in the western Pacific region. On 25 October 1944, during the invasion of Leyte in the Philippines, Mobile took part in the Battle off Cape Engaño, the northern component of the epic Battle of Leyte Gulf, using her guns to assist in sinking the Japanese aircraft carrier Chiyoda and destroyer Hatsuzuki. Mobile continued to screen carriers until late December 1944, as they continued to support the American re-conquest of the Philippines. After being sent back to the United States for a badly needed overhaul in January 1945, Mobile returned to fighting in March 1945 and spent all of April and May providing gunfire support for US ground forces on the island of Okinawa. She remained there until the Japanese were defeated. After the Japanese surrendered in late August 1945, Mobile assisted in the occupation of Japan. In late 1946, Mobile also made two “Magic Carpet” voyages which transported American troops from Asia back to the United States. 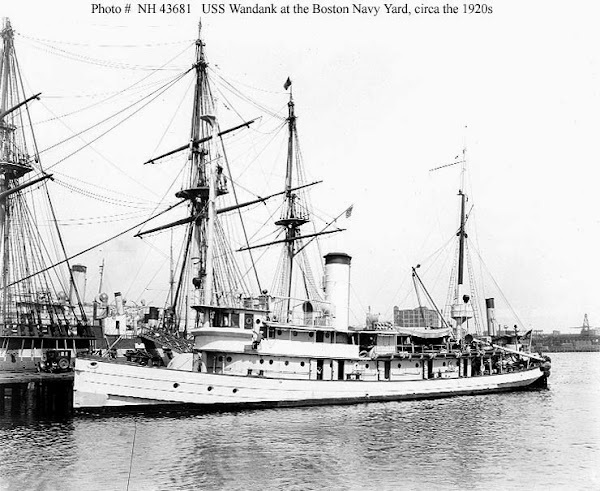 After completing those trips, Mobile was sent to the Puget Sound Navy Yard at Bremerton, Washington, for inactivation. She was formally decommissioned on 9 May 1947, but remained part of the Pacific Reserve Fleet for the next 12 years. However, USS Mobile was stricken from the Naval Vessel Register on 1 March 1959 and sold for scrapping in December of that same year. The ship received 11 battle stars for her service during World War II.